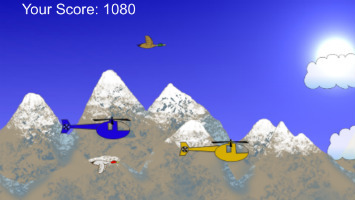 In this free iphone game your goal is to control 2 helicopters at once, which will definitely challenge you as you try to control both, one with each thumb, while avoiding collisions with ducks which always seem to be in your way. You will get a rating when finished, along with your points total, but this free iphone game (i.e. runs on iphone, ipod or ipad) will make it hard for you as you attempt to reach the highest rating.